Grease Traps work by slowing down the flow of warm/hot greasy water allowing it to cool. As the water cools, the grease and oil separate and float to the top of the grease trap. The cooler water (less grease) continues to flow down the pipe to the sewer. The grease is trapped by the trap's baffles, which cover the inlet and outlet of the tank, preventing grease from flowing out of the trap. Brodi offers various treatment options to fit the needs of almost all Grease Trap installations. 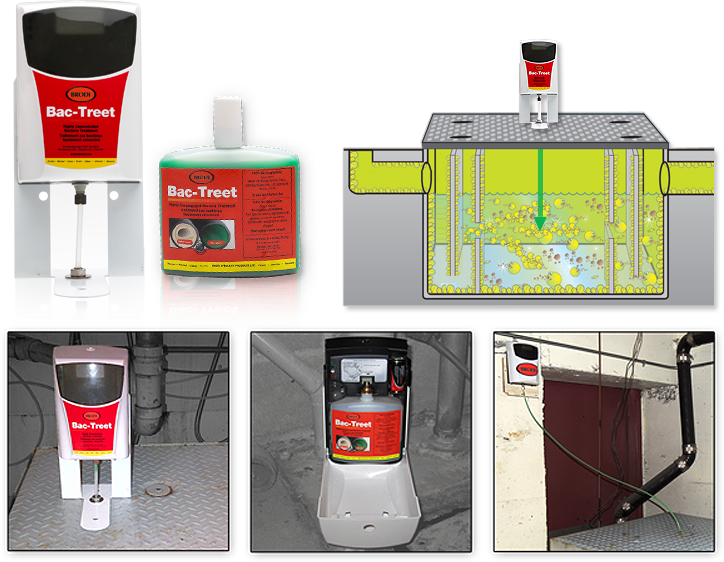 The compact battery-powered Bac-Treet system is simple to install. Professional installation is not required making this a great option for the Do-It-Yourself crowd. The system slowly dispenses the exact amount of bacteria required to build up a colony that will consume the grease in traps so that no grease makes its way down your pipes. Your trap and drains remain clean, odor free and free flowing, allowing you to save money on costly clean out services. For systems that have been neglected and have an accumulation of fats, oils & greases (F.O.G. 's) Use CGTC7150, a citrus-based emulsifier, to break down grease in traps that have been neglected. Use this method for bad accumulations before running the Bac-Treet automated system. Bacterial liquid enzyme treatment for drains and grease traps. 85 Billion bacteria spores per litre. Automated dispenser for the Bac-Treet product line. A battery powered automated dispenser for the Bac-Treet product line.